The Mi’kmaq First Nations people were the first inhabitants of Prince Edward Island. They were a semi-nomadic people who named the Island “Abegweit” which means “cradle on the waves.” European explorer Jacques Cartier is credited for discovering Prince Edward Island in 1534. It was claimed as French land although it was left mostly untouched for almost two hundred years. Very few French came to settle on what they called Ile St. Jean: in fact in a census take in 1735 there were only eleven heads of house-holds (having multiple children and farm animals) listed for the area known as Riviere Port La Joye or the North River.1 A few years later in 1752, a man by the name of Sieur de la Roque took a census of Ile St. Jean and reported approximately fourteen families living on the north side of the West River and six families living along the North River.2 It was only three years later that the English overtook the French and claimed its North American colonies. The Acadian people, after refusing to take an oath of allegiance to the British Crown, the British government had them expelled. In French, this tragedy is known as “Le Grand Dérangement”. Between the years of 1755 and 1758, the British began deporting the French settlers from Acadia which included Prince Edward Island, Northern New Brunswick and Nova Scotia. The population of the Island was virtually depleted. In 1764, the British Government, after having signed the treaty of Paris, sent Surveyor General Samuel Holland to conduct a complete survey of the Island of St. John. He set out in the late fall with a team of men and Mi’kmaq and Acadian guides. The survey was completed the following year. 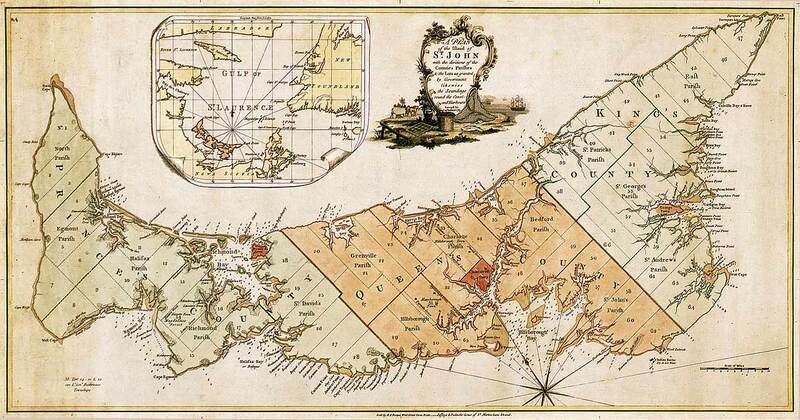 Holland had divided the Island into 67 townships or Lots of approximately 20,000 acres each. He also divided the Island into three counties. A portion of land in each county was reserved for a capital. The western most county was called Prince County, its capital was called Prince Town. In the centre was Queen’s County, its capital was called Charlotte Town. The eastern most county was called King’s County and its capital was called George Town.